We design buildings with masonry for many reasons . . . to be attractive and comfortable, to be durable, to keep out wind, rain and noise. We can also use masonry for energy efficiency. Thermal mass in masonry walls moderates the day/night temperature swings and reduces heat flow to the interior, which reduces air conditioning loads inside the building. For thousands of years, designers and builders have understood the valuable qualities of masonry, but many have become confused about its role in building energy performance. Because of an emphasis on high insulation levels, the importance of thermal mass has been overlooked. We've become more sophisticated about energy efficiency, however, and have now quantified and accepted the benefits of thermal mass. The newest energy standards recognize this quality of masonry walls, allowing a reduction in insulation requirements as wall heat capacity increases. The biggest energy problem in commercial buildings has been to remove unwanted heat. Internal heat gains from lights, equipment and people lead to year-round air conditioning. Outdoor heat gains just add to the problem. But the thermal mass of masonry allows it to absorb much of the heat, reducing the load on the air conditioning system. Here's how it works: For outside heat to impact the cooling system, it must conduct through the wall by warming up the wall material. If the wall has high thermal mass, it takes a great deal of heat and time to warm it up. When the heat finally makes it through the wall, it is less intense. During cooler nights, this process is reversed; the heat flows out of the wall, and cools it down. In many climates, this cycle of heat flowing into and out of masonry walls results in substantially lower annual air conditioning loads. Interior masonry walls work much like their exterior counterparts, but excess heat is absorbed from inside rather than outside. During the day, the walls absorb heat from inside the building - accumulated heat from the sun, lights, equipment and people. At night the heat is released. This helps cool the building during the day and keep it warm at night. Passive solar heating systems rely on interior thermal mass. In the summer months, interior masonry can be "precooled" by nighttime ventilation of the building to better absorb heat and cool the building during the day. R-values provide a measure of resistance to heat flow in walls or other building elements. They are useful in gaining initial understanding of heat flow in buildings, and for calculating peak heating loads. They are unable to account for heat capacity. Therefore, R-values are of limited usefulness in understanding long-term cooling or heating loads, or for predicting annual energy costs. 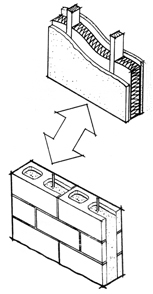 These two wall assemblies are equivalent in performance. One is a stud wall containing insulation with an R-value of R-11. The other is a solid grouted masonry wall with no insulation. Put into otherwise identical buildings in a hot climate, they result in equivalent annual energy performance. Angelus Block Co., Inc. supplies this information as an educational aid in understanding the benefits of concrete masonry construction and our products. It is the responsibility of the user to obtain engineering or other advisory services from licensed professionals as the basis for incorporating into any project any information, detail, or product offered herein.